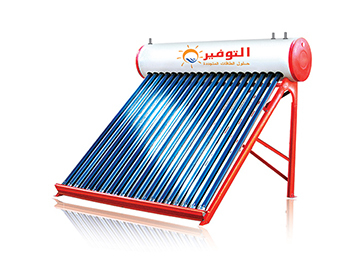 This non-pressurized solar water heater uses the principle of thermosiphon to collect heat from the sun and transfer it to hot water for residential and commercial uses. Widely spread, simple design, easy installation and investment, economical, high thermal performance it’s economical, has an easy plug-in installation and is reliable and efficient no matter of the climate conditions. The system consists of glass evacuated tubes connected to a stainless steel 304 inner tank insulated with high quality polyurethane wrapped with a protection layer suitable in providing hot water for domestic and commercial uses.